Associate Professor of Marketing Sharmin Attaran, Ph.D., center, is driven to put the University on the map for digital strategy education. When you walk by Bryant's Digital Marketing classroom, you might notice something unusual. Laptop and smartphone screens are aglow with Facebook, Instagram, Twitter, and Snapchat. Unlike other classes, where students might be checking social media on the sly, here it is a course imperative. "There are few textbooks for what these students are learning." 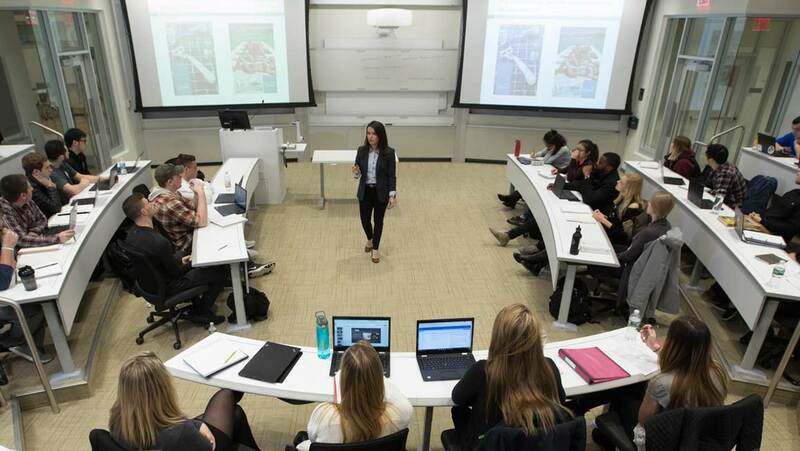 Digital marketing specialist and Associate Professor of Marketing Sharmin Attaran, Ph.D., developed the Digital Marketing class to bridge a knowledge gap between students' digital media skills and businesses' expectations for graduates. Early on, she challenged her students with theoretical clients and projects. "But it was all hypothetical," she says. "I wanted to give them a chance to dive in to real work." Inspired by Bryant's culture and history of connecting students to the community, along with her personal drive to put the University on the map for digital strategy education, Attaran decided to bring real clients into the coursework. Recently, Digital Marketing students, in teams of four or five each, served 11 regional businesses from a variety of industries. Autocrat, John Carol Law, and Rosalina Restaurant were among their business partners. The challenge? Design and implement a digital marketing strategy including goals, tactics, and metrics for success. "There are few textbooks for what these students are learning," Attaran says. "Textbooks just can't keep up with the ever-changing technology." Expectations are steep. Students are required to handle market research, search engine optimization, writing, client management, branding, content marketing, and more as part of their projects. In addition, they must become adept at digital marketing best practices using tools such as Hootsuite, Buffer, and Google Analytics. "At the beginning of the semester, it can be overwhelming for students. But then they have their first client meetings and start working," Attaran says. "It's great to see their confidence grow as they start posting on a company's behalf to Facebook, etc. That's when the true stars come out." As a testament to the hard work of the students, Attaran says she's begun to receive partnership queries from more regional businesses, as well as companies who want to participate again. "During final presentations at the end of the semester, I heard a lot of clients say to the students, 'How are we going to live without you?'" Companies solve this problem by offering students jobs and internships, which Attaran says have been coming in left and right because of the class. Attaran hopes to extend the program by working with the Chafee Center to add an international component. She'd also like to bring in industry experts from Twitter or Snapchat and expand the client list with new industries and different geographic targets. "When I see a need, I want to be active in the community," she says. "When people are looking for a resource for their business, I want them to think of Bryant."